Study: massive U.S. agriculture in the midwest has a climate cooling effect | Watts Up With That? An increase in corn and soybean production in the Midwest may have led to cooler, wetter summers there. In this map, the number of bushels of corn produced are shown in shades of green. February 13, 2018 in Land use land cover change. What was growing on these lands before crops? Interesting that the researchers overlooked the fact that vast tracts of forested land were cleared to make room for crops. Such a omission kind of detracts from the story. Seems all the was changed were the trees for corn or prairies for wheat. Yup! Sounds like guesswork to me. They don’t really know what was going on when the land was in its natural state. They assume “climate change” and infer from there regardless of any evidence that points elsewhere. You are right but it will help them say it is worse than we thought. Wait a minute, the prairie grasses are only active and green for awhile but those great corn leaves are watered and kept green for a long time. This is sort of evaporative cooling, like the old swamp coolers. Who would of thought of this feedback? I say feed them CO2 and keep them watered. Also I like corn. And I also like corn, either on the cob or on the hoof. Hoof part with processing according to the dotted lines on the cow figure. Also popped, watching the house of climate cards teetering. Not all corn is irrigated. Most corn across the corn belt is not irrigated. When flying over the Midwest and West, one can easily spot what is and is not irrigated. Ok Mark W and A TheoK, consider leaf density of corn, some albeit unirrigated, versus natural prairie grass, still a lot more evaporative cooling with the corn. Ron, if what is being transpirated is greater than what is falling from the sky, agriculture won’t continue for long. In most of the area corn is not irrigated. Corn is also a C4 warm season grass as are most prarie grasses. I have been searching for articles on non-irrigated corn in the midwest and not finding any. There is pre-plant irrigation, irrigation schedules for maximum corn yield, and minimum irrigations schedules for areas with reduced aquifer production. Nowhere can I find a totally non-irrigated corn article. Now, I am non a farmer and maybe some corn is produced this way. OK, corn is a grass. Have you walked through original tall-prairie grass and compared it to walking through a corn field? I have both. The leaf density, the producer of transpiration (evaporative cooling!) is dramatically different for these two grass end-members. I still like this article and corn and cows with dotted lines on their sides. In 2012, U.S. farmers irrigated 56 million acres, or 6 percent of all farmland. In Illinois, it is even less, much less. Got a big BS for you there gator69. I read the reference and “farmland” includes ranches, treeland and others. Look at the plot “Irrigated Acres as Percent of Farmland by County” and you see the entire midwest is +40%. Now on to the big question: What’s this about 69 and gators? Ron, you need to learn how to read maps. How much forest green do you see in the Midwest? Sorry, but there is nowhere near 40% irrigation in the Midwest. The figures I came across were outdated, but did not even come close to 5%. I lived and worked in Illinois for decades, and the vast majority of farmland there does not have irrigation equipment. Gator69, great car. However, still BS on the irrigation issue. Try http://www.cropmetrics.com and read state-by-state irrigation acres. Impressive numbers and almost all pumped from aquifers locally. By the way, I have been reading/making/buying/selling maps since 1967, say for 50 years. The basic issue here is whether the high leaf density of corn produces more transpiration (evaporative cooling) than original prairie grasses. I’m sticking with corn. You sent me to a sales site for an irrigation company? Yes, 56 million acres is a big number, but is a small percentage. And the map clearly shows that in the Midwest, most of the counties are less than 1% irrigated. The Midwest usually receives sufficient rainfall to grow corn and soybesns without irrigation. Get over it. PS – As part of my Remote Sensing degree, I had to take (and pass) cartography classes. Take another look at that map Ron. What was growing before crops? More crops. In my area of Wisconsin there were actually more crops in 1937 than today. I can tell this from aerial photos, they photographed the whole state. Very few frees in my area back in 1937, all cropland. More trees today. Wasn’t that the Great Plains of buffalo and grassland? You are spreading alternative facts. IOWA is not all of “The Midwest”. West of the Mississippi was prairie, while the east was forests. So while you might have a point on the Iowa part of the “land use” question, it is not indicative of the land us changes in “the Midwest” as a whole. Your points, especially regarding Iowa, are correct or roughly correct; but, prairies were prairies and started as one moved west away from the Alleghany mountains. Both sides of the Mississippi River North of Louisiana were prairie. One needs to remember, that the natives regularly burned the prairies to keep it mostly grasslands. Trees grew along streams, gullies, river edges, etc. Once one starts traveling through America’s West, a key landmark identifying where man lives, are trees. Man plants trees as wind breaks, shade, wood sources and even landscaping. In America’s arid West, when man abandons a property, the dies from lack of water; yet, stand for decades marking where man failed to stay, but planted trees. • Cherry picked start period. • Short time frame. Ignores centuries of grass lands. Ignores farming since the 18th century. • Gross assumptions; e.g. agriculture=cooling=precipitation increases. • “The area of crops did not expand by a whole lot over that time, but crop production increased substantially, leading to large increases in crop yield”. • Verified via models… Yeah, sure. It’s called confirmation bias! ERDC needs to seriously review this research and test assumptions. • In other words, fudge factors to properly “adjust” cooler rural temperatures. Look at the Currier & Ives print of the Great Planes Prairie Fire as an example of those set annually by the Indians – till we stopped it. On the hunt, Indian men used numerous small fires to direct herds of deer into smaller and smaller circles, making them easier to kill. I’m sure none of those fires ever got away from them. Gator, search Currier & Ives print of Great Plains Prairie Fire. Looks to me like they were out of control or at least Very Large. I discussed these issues [urban-heat-island and rural-cold-island effects] in my book “Climate Change: Myths & Realities” of 2008 at pages 103 to 123 under ecological changes. Also on several occasions highlighted the role of these in global surface measurements based temperature data, wherein met net work is concentrated in urban areas [and thus over emphasising the warming] and sparse and unevenly distributed rural met network in rural areas [and thus under emphasising the colder temperature conditions]. However, satellite data over comes this imbalance in global temperature. What was growing there? Tall grass prairie, of which there are a few remnants left, and shortgrass prairie, a few remnants lefts, also, as well as native species of wildflowers such as rattlesnake master, prairie smoke and liatris that most farmers consider to be weeds. There were forested areas, which also have remnants left, as well as savannahs of various species of oaks and maples. Some species of grasses such as turkeyfoot can grow to six feet in height. AGW believers clutching at straws. Does this mean we have to pay corn farmers twice, once for growing the ethanol scam and again for direct climate modulating efforts? The non-lobbyists want to know and the non-voters in the Iowa caucuses. There is a major effort to show that Corn Ethanol has lower and lower emissions and much greater global warming benefits than previously thought. Early on, in the 2005 time frame, many thought that the life cycle CO2 benefits of corn ethanol were actually negative. Over the years, the desire to increase ethanol production led many to reassess the LCA of ethanol and now many believe that there is a 50% reduction in GHG emissions relative to conventional gasoline. In the past, Land Use Change (LUC) was considered negative as much CO2 was released from the soil when the land was cultivated, and there is also a lot of N2O emissions from fertilizer use. This new study will give ammunition to those that want to claim LUC is actually beneficial and we should grow (and therefore use) more ethanol. However, from the engine point of view, EtOH is not a good fuel and it has no actual benefits to regulated emissions in vehicles equipped with catalyst converters. Contrary to all those that claim many benefits for EtOH use! Lower emission in what manner? Lower energy density (energy density per unit volume) of E85 ethanol means 1.5 gallons must be combusted to produce the equivalent of 1 gallon of gasoline. That correlates into 1.5 times as much CO2 created to produce the same amount of energy. Over the years, the desire to increase ethanol production led many to reassess the LCA of ethanol and now many believe that there is a 50% reduction in GHG emissions relative to conventional gasoline. Ethanol simply has less energy density than oil and the ROI for ethanol does not justify its expansion as a biofuel. So remove the subsidies and let them have at it! I’ve read that ethanol cleans engines and lines of gunk, and helps them last two years longer on average. ALL of my small engine mechanics and operators swear the exact opposite: If you want a small engine (2-stroke, lawnmower, cart, buggy, or even chainsaw or blower) to last more than 1-1/2 seasons, use ONLY straight ethanol-free gas. NOTHING else! Sounds like you are saying the data didn’t change, just the motivation of those compiling and interpreting the data. I should have specified that I was speaking of 4-stroke auto engines. In 2-stroke engines, I believe the weak point is the hoses, which become brittle because of ethanol. An alternative to gasoline plus 2-cycle oil are special formulations of other hydrocarbons now widely sold in hardware stores, at an expensive price. Does this mean we can counteract the effects of global warming by increasing our use of intensive agriculture? As someone who worked in those corn and soybean fields in Illinois, I can assure everyone here that those crops DO NOT cool ANYTHING. Those fields were ALWAYS much watmer than the surrounding areas. The above study is pure BS. Actually I have similar experiences, but the difference is people measure relative heat, not temperature. The temperature in the corn fields is lower, but the humidity is high and therefore the total enthalpy (amount of heat) is higher then the surrounding areas. As a human we only can “feel” whether heat is flowing into our bodies (feels warm) or out (feels cold). A 80 °F day with low humidity feels far more comfortable than a humid day with the same temperature. Likewise a foggy 50 °F day will feel quite chilling. Add to this the almost total lack of wind movement at ground level in the high corn and it will feel hugely oppressive. All that water evaporating is absorbing heat from the air thereby cooling it, but if the humidity doesn’t get transported away the “heat” will not be going anywhere. But, of course we know the humidity is being transported up into the fluffy cloud forming where the thermal tops out above the field. Do thermometers also “feel” warmer? Because ours showed definitively warmer temps in cultivated fields. Nope thermometers only measure temperature. Could the areal % of ground cover on the cultivated field have had the effect of local surface albedo decrease and hence greater solar energy absorption? See my post below. Cultivated crops raise temps. A fifty degree day with little are no moisture is cold, far colder that a foggy day. This desert dweller learned that after moving from a damp climate(Northern Minnesota) to a less damp climate(western North Dakota) to a dry climate(Mesa AZ.) There is little heat in dry and the heat you have is sucked out of you fast. I take care of a patch of grass here in Mesa my development has a small dog park. It not unusual to have frost or ice from the sprinklers in December/January even though the ambient air temperature as measured did not drop below 40. If there even a hint of humidity in the air that does not happen, also with humidity in the air the temperature drop is not as fast when the sun goes down. Probably feels hotter because more humidity and no shade. “Using maps and data from hundreds of satellite images, the researchers calculated the temperature, the amount of water given off and how much light was reflected rather than absorbed for each of the different types of vegetation. They found that compared to land cultivated with other annual crops, sugarcane reduced the local air temperature by an average of 0.93 degrees Celsius (1.67 F). Can’t speak to the Upper Midwest portion of the study area, but Kansas and Oklahoma were primarily tall grass prairie prior to human agriculture. This is a fire dependent ecosystem. We have cedar infestations in Kansas over the last 90 years as humans have built roads and plowed fields that act as firebreaks. I suspect that the wheat crops in Kansas act similarly to the preexisting prairie, because they are both grasses. 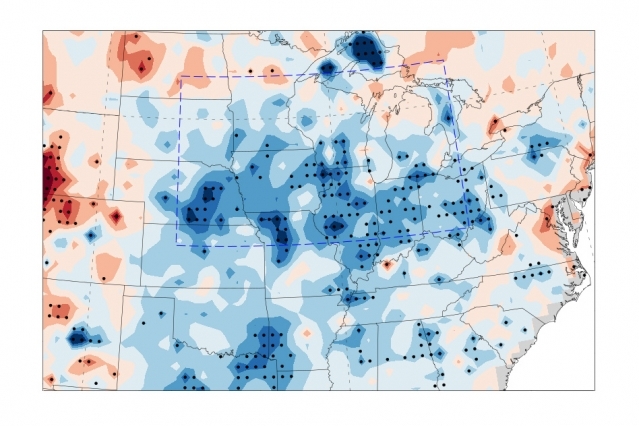 The strongest effect in the study appears to closely match the corn belt. Not familiar with “cedar infestations”. Are cedar trees infesting the prairies, or insects are infesting the non-native cedar trees? Red cedars used to be burned off with the prarie/savannah fires. They are fast growing and birds spread the cone seeds. We have red cedar infestations in places in SW Wisconsin. On my farm, I chain saw them down every few years although has really only been a problem on the eastern edge of one pasture. Dunno why. My dairy farm in SW Wisconsin (the Uplands along the lower Wisconsin River) was all burr oak savanna (prairie with occasional burr oaks), also fire dependent. Was settled well before 1900. All the hardwood forests that exist there now on the untillable hillsides are because of farmland fire suppresssion. Provable by dendrochronology of non burr oak species like hickory, red, white, and black oaks, and hard maple. Biggest trees of those species are <150 years old when logged. Those ‘man made’ forests in the uplands, not crop intensification, changed the region’s microclimate. OTH, all of Illinois south of Chicago was tall grass prairie, now just corn, soy, and some alfalfa/oats. Chicagoland was more oak savanna and is now just suburbs as far as the eye can see. Tony I said dendrochronology, not treemometers like Mann uses. Appreciated your joke. Our local area was settled ~ 1850-1880 after the 1840s Blackhawk wars west of Madison—we have a hiking/biking trail from Madison to Dodgeville (about 40 miles) called Military Trail. Was originally the trail used to move troops west during the Blackhawk wars. Nearest Indian effigy mound from Mississippi culture is only about 5 mils from the farm down along Otter creek, named because it had river otters before they were all trapped out for fur. Also, the nearest town to the farm, Avoca, was founded as a little provisioning stop for the spring rafters relying on the snow melt to float rafts of white pine logs from northern Wisconsin down the Wisconsin river then down the Mississippi to St. Louis for lumber milling ‘to build the west’. Most dont know lumber company Weyerhauser was founded in northern Wisconsin by Germans, and only later moved operations to the Pacific northwest. Much of their old logged area is now national forest or Menominee Indian reservation with beautiful white pine regrowth. We have written regional weather records going back well before 1900 thanks to U. Wisconsin Madison, founded in 1848. So don’t need treemometers. We don’t have a long history, but it is an interesting one. Highest regards from this side of the pond to yours. Would love to see a comprehensive study of the massive changes that have taken place over which trees are growing where and when they were introduced. Had been told since a kid (60 years ago) that all of the oaks on the NE were planted there to support the shipbuilding, that the oaks in the south were cut down to build ships and then replaced with faster growing pines. No thought whatsoever about the birds, bees, mammals, reptiles, etc that depended on the trees for their livelihood. These changes had to affect weather, water sheds, subterranean water level, and many other things. And the present breed of “Environmentalists” are only concerned with maintaining the present status quo. I must have missed it. What do the black dots represent? I had to look at the actual journal article to find out what the black dots means. They indicate statistical significance at or greater than the 95th percentile, correlating precipitation and temperature. Whoa whoa whoa! They’ve always dismissed the idea that these impacts were “significant” and claimed they were almost inconsequential. Pielke Sr nailed it. Oh, so now I see why scientists would now be on the “land use impact” bandwagon. So much for “the science is settled”. I’m an old farm boy (grew up there). Haven’t looked at the paper’s details, but we used to judge corn growth as proper if “knee high by the 4th of July”. So April and/or May are basically black ‘dirt’, June is small young plants, July is half-grown corn, and A/S/O is full-grown corn. Then frost hits – harvest is done by November (all average years). The thermal budget relating to CO2, H2O, temp modification, albedo etc. varies greatly over short time periods. Their premise makes some sense (if really measured) for a few months. Then the areas studied turn white and frozen for several months and everything stops. If they are right, they should see short-term changes in effects that vary each year (season). If this is all just models the variability will be smoothed out, but should be apparent in wider standard deviations, which make it difficult to get significance. IN/IL/IA were tall grass prairies where a man on horseback was barely visible before it was ploughed up. That should have done the same thing. Great point. And in SW Wisconsin on my farm, summer temps do not correlate at all with stage of corn growth. They do with weather fronts depending on from south, west, or north wind orientation. South means 80’s, humid, Tstorms. West means hot 90s and dry. North means cool (high 70s) and usually dry. Indiana was actually heavily forested in the Central and Southern regions. Now, a new study by researchers at MIT and Dartmouth College reveals how another type of land use, intensive agriculture, can impact regional climate. And they had to go to university to figure that one out? The genuflection to the alter of CAGW. If you add up all the papers you seen here that suggest alternate climate drivers and then make that sort of disclaim, it makes you wonder if the combination of all those doesn’t explain why CO2 has not proved the models right. Just too much else going on all through history for the magic molecule to be really felt for all its robust [sarc] photon absorption/re-emission. Yup there has been an overall pattern of global warming since the end of the LIA. Last Thames ice fair was 1814. But there cannot have been any AGW until after 1950 (not enough delta CO2 per AR4 WG1 SPM fig 4). Worse, it cooled from 1950 to ~1975. Worst, except for the now cooled 2015-16 El Nino blip, it hasn’t warmed this century except by Karlization or Mearsation. Yet this century comprises about 35% of the entire increase in atmospheric CO2 since 1958 (Keeling curve). The big attribution bust. Thanks for the UHI driven alarmism. Gator, you didn’t get his point. He was demonstrating how the quote conflicts with the alarmist meme. I don’t think there is any evidence whatsoever that shows climate cultists recognize and shift their thinking after falling into contradiction. Simple question: CAN humans cause climate change? — just not in the way advertised? Yes, regionally on land. Land use change (more/less forest), UHI, pollution (aerosols). Probably not globally since 71% of the Earths surface is water where humans aren’t. Micro-climate vs. regional climate vs. global climate. The first two seem reasonable. The third, … not so much. Of course the obligatory, assumption that this finding is masking the warming that should have taken place. Yup, this paper is just another major yawner, chalk it up to the publish or perish and all changes are due to man department. I’d love to know how they would explain the dramatic climate shift in North America during the 16th century. I have worked diligently over my 40 year career to remove SO2 from the combustion gases generated by coal fired power plants. We have done such a great job that there is now areas of sulfur depletion in the soil of some of the farmland in the mid-west and south-east. This causes less crop production due the lack of this nutrient. Many farmers are now purchasing gypsum that is generated by removal of the SO2 from the coal fired power plants to apply to the soil to restore previous production levels. Does this mean that global warming may have been accelerated due to the removal of SO2 from the emissions of coal fired power plants? Should we now reduce the amount of SO2 being removed from the combustion gasses of coal fired power plants? The original design removal efficiencies was 70%. The states and EPA have ratcheted the removal efficiency up to 95 and even 98%. Even those systems that operated at the original 70% removal are now forced to remove greater than 90%. The EPA and by inference the States are always ratcheting up the removal efficiency of “pollutants”. After all if something is bad the more you remove is good, right? There have not been any studies conducted by the EPA or anyone that I can find that analyzed that last sentence of the preceding paragraph. Is there a limit of diminishing returns and even is there a limit to actually causing harm. Lets look at the example of SO2. Coal fired plants remove SO2 by using a reagent (limestone), power to remove (fan and pumping), and power to convert to gypsum (pump, filtration, blower, conveyance). If the gypsum is returned to the soil via fertilizing efforts by the farmer the cost of transportation including fuel usage has to be added to the production costs of the gypsum. All this to replenish soils that are lacking SO2 due to removal of SO2 from coal fired power plants. If the coal fired power plants were allowed to emit more SO2 or to put it another way lessen the removal efficiency from 95% to say 85% the positive impacts would be obvious. Less reagent, less power consumed, less transportation costs. All this would take is some slight adjustments to the processes at the coal fired plants to reduce the removal efficiency. If the EPA was truly concerned about all areas of environmental stewardship these type of situations should be addressed. Another example is particulate control. The removal efficiencies of the devices to remove particulates is 99.8% and above. Would lowering the removal efficiency have a benefit? I’m fine with removal of all the crap from coal smoke. Take a trip to China some time. They need to do something. I’m also fine with CO2 emissions – increased CO2 is generally beneficial. Thanks Steve, You state the issue that confuses those that are not familiar with the issues of emissions from coal fired power plants. As you state “the crap from the smoke stack” needs to be reduced but those pollutants are mixed in with the CO2 to become pollution as 1 entity. Therefore you get statements like “even if CO2 emissions turn out not to be an issue you have still reduced pollution from the plant if you removed CO2”. All pollutants are bad with one cure. And of course that is not the case. It irritates me when you see pictures of coal fired power plants with those ominous pulsing white and grey plumes being emitted from the stacks and cooling towers. The article that follows will be about pollution etc. Those ominous plumes are an indication that the gas being emitted is clean. The plumes are moisture laden plumes. The gasses have been scrubbed and this results in those plumes. Not only that but the plumes from cooling towers is all moisture laden air. As a chemist whose family with young children once lived 150 yards from the chimney of a copper smelter with no SO2 reduction, I agree with every one of your sentences. My first graduate job was with CSIRO in plant nutrition, where sulphur needs were part of normal considerations. Not all people like the powerful smell of SO2 in the air, but in the domestic gardening scene over the years I have often seen how plants love sulphur, how they are commonly starved of it. But, you realise that your suggestions to liberate some atmospheric SO2 are completely contrary to current perceived wisdom. I will not live to see such common sense applied. In some ways I am reminded of “diseases of the rich” like polio, whose risk is said to increase in families raising children in near-sterile conditions rather than amid the muck and mystery of children doing what children love. We need a modern society in which people can do what they love to do, rather than what they are told to do by an increasing army of control freaks. God speed the plow…. By this wonderful provision, which is only man’s mastery over nature, the clouds are dispensing copious rains … [the plow] is the instrument which separates civilization from savagery; and converts a desert into a farm or garden…. To be more concise, Rain follows the plow. The basic premise of the theory was that human habitation and agriculture through homesteading effected a permanent change in the climate of arid and semi-arid regions, making these regions more humid. The theory was widely promoted in the 1870s as a justification for the settlement of the Great Plains, a region previously known as the “Great American Desert”. It was also used to justify the expansion of wheat growing on marginal land in South Australia during the same period. According to the theory, increased human settlement in the region and cultivation of soil would result in an increased rainfall over time, rendering the land more fertile and lush as the population increased. As later historical records of rainfall indicated, the theory was based on faulty evidence arising from brief climatological fluctuations that happened to coincide with settlement, an example of the logical fallacy that correlation means causation. The theory was later refuted by climatologists and is now definitively regarded as pure superstition. You beat me to it, I was going to site the old “Rain follows the plow” meme. It seems the American Midwest was in the midst of one of its periodic droughts in the early 19th Century as people began to move in to and farm the area. The drought came to an end and people associated that with their actions. Similar Midwestern droughts occurred in the 1930s and 1950s, and the meme was discredited. Now days, the gradual warming of the atmosphere as we recover from the Little Ice Age is coincident with the rise of CO2 and and with industrialization. The same mental fallacy ensues that our actions have caused the rise in carbon dioxide and also the shift in climate. However, the temperature rise is not keeping pace with the CO2 levels (of which human contributions are only a small portion). Soon they will have to admit they got sucker punched again. What I find laughable is the contention that this will improve the ability of global climate models (GCMs) to simulate local changes in precip. The dirty, dark secret is that GCMs don’t DO regional climate. They all disagree with each other on a regional scale, so no one publishes those results. This study really isn’t going to help with what is a fundamental flaw in the models. Common cause and effect error. The plow follows the rain, not the other way around….just like most of the comments above. The only reason for this is that it gives a basis for another adjustment at apply to the temperature record. Making it Worse Than We Thought. My BS meter has gone off the scale with this claim. To me this sounds like their trying to explain away some unwelcome cooling. What’s far more likely is there has been a changes to the weather patterning over this area. Which has lead to a increase in cloud cover during the summer months. lf the weather stations across this area have kept sunshine records, then l would be checking them to see if there is a decline in total sunshine hours during the summer months over the years. Eltahir explains that plants “breathe” in the carbon dioxide they require for photosynthesis by opening tiny pores, called stoma, but each time they do this they also lose moisture to the atmosphere. However, the slight increase in Carbon Dioxide Levels since the 1950’s has caused a reduction in the size of the Stoma and decreased the overall amount of evaporation from plant leaves. With the combination of improved seeds, fertilizers, and other practices, including the fertilization effect of enhanced Carbon Dioxide levels (approx 25% increase from 300ppm to 375ppm)(currently 400+ppm) between 1950 and 2009 the annual yield of corn in the Midwest increased about fourfold and that of soybeans doubled. These changes were associated with denser plants with more leaf mass, which thus increased the amount of moisture released into the atmosphere though was offset by decreased stoma size acting to decrease overall evaporation. That possible extra moisture served to both cool the air and increase the amount of rainfall, the researchers suggest. Fly over Eastern Colorado and admire all the big “circles”. The Ogallala is dropping rapidly. Wouldn’t there have been a similar situation when most of the same areas were open prairies and planes? I suspect that over-tillage of the soil had something to do with previously dryer/hotter conditions, especially when the crop plantings were less dense and herbicides were used. I remember being able to walk easily between rows in the 70’s where it is nearly impossible in my crops these days due to the advances in equipt. Forgot to mention zero-tillage methods in use everywhere now. That gives the annual weeds that grew after harvest some time to work in spring before we burn it off (with glyphosate) to drill in seed. Midwest cropland generates much lest dust from tillage than when I was a kid. Martha would say”It’s a good thing”. This, of course, supports UHI contentions and station location as a probable cause (leaving aside data adjustments) of global temperature increase. One can’t have it both ways: If agricultural sprawl reduces temperature, urban sprawl must increase it. On a summer evening around dusk, the hottest zones are where my gravel road runs, around my house, my barn, outbuildings and dry lot. In the fields and pastures it cools much quicker. Sometimes there is a 10-F difference between the south and north faces of my house, the north side is at the edge of a large stand of timber. UHI is a very substantial factor even in rural settings. Probably accounts for most of what people tell themselves is global. Infrastructural heat retention and dissipation. Should be a good branch of architecture/engineering for a budding young scholar. We have also increase the surface area where we live add to the heat retention. An average house add nearly 200% more surface area, a multistory building far more than that. Each of those surfaces store heat. You can also add in most building materials hold heat much better than vegetation and we do eliminate a lot of vegetation. Yes we do change the local climate and that where we make or climate measurements, yet we only occupy 3% of the world, due to those facts I believe somehow our measured change and our actuality impact are worlds apart. amazing to find a cooling effect within the much larger warming effect. It’s not like our cows don’t fart. So they’re going to ignore the physics of LWIR emissions by water vapor whose warming effects are 75x that of CO2 and instead suggest that regional transpiration caused cooling? … this is simply wrong. Measuring temperature, whether locally, regionally, or globally, involves recording a given temperature at that location and at that point in time. Aggregated on the whole, it is disingenuous to claim it would’ve been warmer without the commensurate increase in agriculture given (a) the reason above as well as (b) the false narrative of assuming what any given temperature at any given time ought to be. I suppose there could be something to “regional climate change”, but as with global climate, there are way too many variables to pinpoint what effect man might have. In the end, I suspect it’s just more of counting how many fairies can dance on the head of a pin. The earth couldn’t care less, and neither should we. It was the Bison here in the Midwest first. Even though they seem to be able to breed with cattle, they’re actually closer to Goats. Big Badass Goats. These BBG’s were here for thousands of years and anytime there was a drought, that sea of BBG’s would eat the forest. There wasn’t anything but patches of grass here and there until we slaughtered them. Now we have trees in the Midwest. I love trees. They are they’re own breed but, I still call them goats. Fire was what primary control the woody plants from growing on the plains, in drought the roots burned out. Buffalo did occupy the woods also, but the plains buffalo’s north and south migration was the larges single animal migration that we know of during the reign of mammals. The migration patterns of the species before mammals is unknown to us. So basically, with more intensive growth rates from more fertilizer and irrigation, more of the sun’s energy went into photosynthesis to make hydrocarbons and therefore less went into making heat. This same effect is occurring right now on a global scale with the increase of CO2 intensifying gross primary productivity, greening the entire planet = the higher percentage of solar energy going into growing plants is reducing the amount to cause heating. But then … in a natural setting you’d get that energy right back out as heat via respiration when the additional animal life eats the additional plant life. That part of the equation isn’t happening in the Midwest, it doesn’t get eaten there – it gets shipped out and eaten elsewhere. So I guess the real cause of the cooling is pesticides plus trucks and railroads? Another massive blow to ‘Settled Science”. CO2 not only makes the plants grow faster and better, but it also releases water to cool the Planet. Hang on to your Grants and Funding. Hello educated idiots that published this study, man only occupies 3% of the surface of earth. Do you really think we have much effect. Of course “climate scientist” forget this fact, also since most thermometers exist in that 3% so when the rest of the world does not agree with the increase of temperature they assume the measurement that are going down are wrong. Add in due to UHI they adjust the non conforming measurements up, and make up measurements for where we have no thermometers the infill that data with their WAG, add in again their schlock work leads to were most of the time they manage to loss 40% of the measurements where we do have thermometers. so then again they infill that data. and yet I suppose to panic when they announce that the last year was the “warmest ever” somehow my BS meter is on full alert. Add in they only use the temperature reading and no humidity that in the air, they really have no clue what and how much heat is really there. Here is a case the in reality so called “climate scientist” are really keystone cops. To bad the LCDs that exist in out media and political class believe their adult bovine fetal mater. Add in it adding at least 20% to my electrical bill and to my tax bill yes I am not very happy with this stupidty. “the rain follows the plow”…. really the opposite. corn/soybeans makes record harvests and cools/humidifies the farmland?? Correct. Hot and dry doesn’t grow corn worth a damn. Aflatoxin was a huge problem in the Midwest in 1983 and 1988. The heat and dryness ruined a lot of the crop. Commercial purchasers performed very rapid tests of incoming corn haulers, and armed guards escorted the drivers of trucks off the premises if their load failed the test. The WSJ reported that the drivers who had been turned away then delivered the corn to barges headed for New Orleans, where they were loaded on freighters bound for foreign ports. The USDA tested the corn, but it took 6 weeks to get the results, and by that time the corn was long gone. And I wonder about the “factor” that accounted for the density of the foliage. This single factor managed to force the model to increase humidity, lower temperatures, and increased precipitation. And this was taken as collaborating the hypothesis. I seem to recall that water vapor is a potent GHG, plants consume a lot of CO2 during the growing season, and all of this works in a very complicated fashion. But despite all this complexity, the models still behave as simple linear projections of CO2 concentration, based on Pat Frank’s work. I prefer the MIT model that led to the butterfly effect. That at least has a logical foundation. And who knows, if a butterfly can (theoretically) modify weather, how about those ten of thousands of commercial airliners seeding the stratosphere with their own, very pronounced, vortices? So did they use the Karlized adjusted temperatures or the homogenized bogus temperatures, or the actual station temperatures as recorded during the actual period? The first two get adjusted every time a new entry arrives at the database – causing past measurements to invariably go down, while the last one is probably closer to reality. There could plausibly be an intensive agriculture/temperature decrease correlation with evaporation as the likely causation mechanism, but I wouldn’t trust most temperature databases to find it. Roger Pielke Snr has been making the very strong point that land use changes are the biggest impact on local climate. This goes beyond urban heat islands and is particularly important with regard to agriculture. North America has experienced two major land use changes over the last 100 years (give or take). The first one is a massive re-forestation of areas previously logged out in the 17th, 18th and 19th centuries, much of it on the eastern part of the continent, but continuing into the west. The second one is the intensification of annual crops, mostly taking place in the mid-west and the prairies. That these land use changes have an impact on local air temperatures (by whatever mechanism is your favourite) is a bear defecting in the forest kind of issue. It is so obvious that many have tried to ignore it when talking about global temperatures. What has been forgotten is that all temperatures are local; That is, any global temperature is made up of many thousands of local readings. To dismiss local temperature changes as an ‘anomaly’ is to forget what a global average really is. I grew up on the northern plains during a time were agriculture practices believed that a blacken field in the fall was desirable. when those fields had a bit of black peak out the snow, the snow would be gone in days. The native prairie would be weeks behind. and since I was only twenty miles from the northern forest I learned the forest could be over a month behind the farms fields thaw. North America has experienced two major land use changes over the last 100 years (give or take). I had heard that climate change was altering animal behavior, but I had not heard about these bears who are abandoning their countries. Has any study measured an increase of clouds due to corn putting more humidity into the surrounding air than the natural vegetation? Low thick clouds can act as a cooling process and the storms they produce can mix the upper colder troposphere air downwards. This can explain both the cooler temps and increased rain during the last 100 years of Illinois. Any thoughts on this idea? Wait, thought this area was warming? Be interesting to see if current summer temp trends for that area show warming, then I’d like to know what data source they are using. So therefore CO2 is not the Lacis control knob? Just a thought/observation. Every time (ok, overgeneralization) you see a map like this, it always seems to be presented as “cooler than normal” or something similar, indicating that everything is getting warmer and cooling is an aberration. Let’s turn it around. What if the “cooling” is closer to normal, and the warm spots are the aberration. Correlation does not prove causation, but take a look at the summer temperature map. Note the warmer temperatures in the northeast. Note also that they correlate with the Washington-Baltimore corridor and on to New York City. Note the two hot spots to the west of, and north and south of, Lake Ontario. They correlate with Toronto (to the north) and Niagra Falls/Buffalo to the south. The hot spot in western Kentucky appears to correlate with Owensboro, though I’m not familiar with that part of the country to guess why Owensboro might be a hot spot (peculiarly enough, Louisville seems to be a cold spot). This was just a cursory review, and much of the western US is cut off, but at a quick glance it really looks like the hot spots are the anomalies due to urban heat islands. As a follow-up, the thought occurred to me that this might be comparing apples to reindeer. To the extent there may be any relatively undisturbed tall or short grass prairies left, they should probably compare less farmed to more farmed. for woodland areas, they should probably compare more pristine woodlands to areas that have been logged and converted to farmland. I think including all the temperature data, even those from urban/developed areas, skews the results and may lead to misleading conclusions. Sorry, that was not the final thought. There’s a lot of discussion about urban heat islands, but what about “non-urban cool islands.” looking at the map again, I noticed that there is cooling trend along the border in the south-central Virginia/north-central North Carolina area. This also correlates with the Roanoke River and two large reservoirs, Kerr Lake and Lake Gaston, that extend along the VA/NC border in this area. I’m curious whether the construction and filling of these reservoirs may have contributed to the cooling trend in this area. Since more than a decade, I was discussing this issue. Included in my book of 2008 “Climate Change: Myths & Realities” under section Ecological Changes [pages 103-123]. In my latest book “Climate Change and its Impacts: Ground Realities” of 2016, on page 51 presented a brief note referring the above book. The main component of human activity is ecological changes, not associated with greenhouse effect [more details can be seen from Reddy, 2008]. Ecological changes are associated with changes in land use & land cover and water use & water cover. They include urban-heat-island effects and rural-cold-island effects. —- Changes in agriculture [dry-land to wetland], water resources development, reforestation, etc will bring down the global temperature if it is added; but in reality the met network was and is sparse in such areas and thus the effect is under reported in averaging of temperature. — However, satellites and balloons data takes these into account”. I think they really need to look at an weed out other potential causes for these anomalies before they start making conclusions. Phil R, here in rural west MD, the highest summer temp has not reached 90F (highest is 89F) in 3 out of the last 4 summers. I know good rainfalls amounts have alot to do w/this — evaporative cooling. Don’t forget that before German farmers the Great Plains were geoengineered by the Plains Indians, who burned the forests in order to encourage the growth of buffalo herds. Not just the central farm belt. All plant life is enriched by CO2 fertilisation and due to enhanced water uptake and transpiration exerts a negative feedback on CO2 supposed “sensitivity” in regard to warming, which could be close to zero. I read a little piece by the WMO that flagged up that they thought micro- climates had changed but not the climate at large. addressed in prior WUWT posts, argued that irrigating the California central valley resulted in warmer nights and cooler days- thanks to plant transpiration- with an overall net warming. Why the difference with current midwest results? My guess is that one difference with the midwest, which supposedly showed overall COOLING, is that before irrigation, the California central valley was dryer, closer to being desert. Deserts get very hot during the day, and quickly lose their heat at night. Irrigation and planting crops in a desert could result in cooler days thanks to plant transpiration, and less cold nights, thanks to that ground cover. In contrast, the midwest already had grassy plain groundcover- reducing heat loss from the ground at night, but also get an additional transpiration cooling effect thanks to the additional leaves of corn compared to prairie grass. Look at the increase in avg summer temps — you can see the megalopolis from Norfolk, Va up thru DC & Baltimore & on up Rt 95 to New York and beyond. You want your urban heat-island effect? There’s your urban heat-island effect. Yes, that’s the point I made above. Even with just a cursory look at the temperature map, not only do warmer areas correlate with urban areas (cities), but there are several cooler areas that seem to correlate with known surface features, such as reservoirs, rivers, and even areas of shale gas production (e,g, north central Pennsylvania). I wonder if they tried to identify and correct for possible correlations with known surface features before they did their data interpretation. Maybe all those wind turbines in Iowa and Illinois are sucking the energy out of the air causing temps to fall consequently more precipitation. Right. Half a degree Celsius of cooling is small. 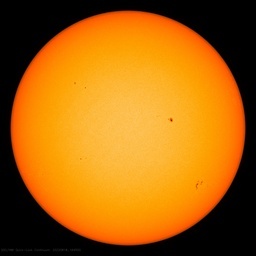 Half a degree of warming, on the other hand, is monstrous and must be stopped. I have been pounding this idea in association with the greening of the planet for quite awhile and haven’t been able to attract much discussion. The Greening has resulted in 18% expansion of Of “green cover” in 35 years (I began when 14% expansion of forest cover was announced ~5 years ago by Nasa). This is not only an exponential development, a huge sequestration of ‘carbon’ but also an endothermic (cooling) process. It completely took the climate people by surprise. Indeed after some making it out to be negative, silence fell on this elephant in the science parlour. This amounts to some 500 billion new trees (there were 3 trillion trees on the planet ) with an average age of ~15yrs and they sequester 25kg of C/yr – almost 190GT of carbon. Imagine the heat of 190Gt of anthracite being burned as a measure of the heat sequestered! Moreover, dare I say It, it makes fossil fuels renewable and sustainable. How about a credit to fossil fuel producers for out put of renewable, sustainable energy? Dartmouth study (Jonathan Winter, again) concludes colder winters in the southeast US are a CAGW “anomaly commonly referred to as a Warming Hole”! Cooling is now ‘a hole in warming’, in classic George Orwell “1984” propaganda style.